The Mamelles Park is located on the mythical road "la traversée" ( D23 ). Crossing the road , 17 km long , is the only road through the mountains of Basse-Terre, through and through. It connects the town of Petit- Bourg in the Pointe - Noire in the mountains . This route allows to enter the heart of the dense forest and reach the Mamelles Park. Several road signs indicate you Mamelles Park with " ZOO AND BOTANICAL GUADELOUPE " . The zoo is opened everydays in the year, from 9 am to 18 pm without interruption, even in public holidays ! The visit is lasting an average of 1H30 to 2H30 max. on demand by phone : call 05.90.98.83.52. These prices may change during the season. * Children prices : You may prove the age of the child at the enter of the zoo. Subscription(s) valid(s) 1 year since the purchase time. Zoo de Guadeloupe + Habitation Côte-sous-le-vent = smaller price ! 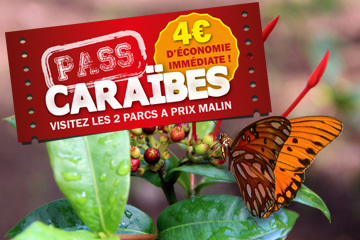 Purchase both parks (zoo + Habitation Côte sous le vent in Pointe Noire), and earn a 4€ discount on the total price ! Uploaded by ZoodeGuadeloupe on 2018-06-19. 85 different carribean and guyana species are living in the zoo. You can find mammals, birds, reptiles and even arthropodes : over 450 animals dispatched on 4 ha of tropical forest. These meetings are special moments you can live with the staff of the zoo. It allow you to undestand the purposes of our zoo and shows the actions for saving and protection of guadeloupean wild fauna. The duration of each meeting is about 10 to 15 minutes, depending on the number of your questions. 2 parkings are located in front of the main entrance and at the other side of the road. Didactic boards can be found all along the path making your visit a peacefull moment just as much as a cultural pleasure. The path has been built in order to ease your visit. 90% of the visit can be covered in the shade of the tropical forest, on a anti-skid ground. the path are equiped with gardrails. The treetop trail zone is optional and may be avoided if necessary. Furthermore, the zoo is working hard to obtain the Tourism Handicap label. This label guarantees an adaptive visit for Handicapped persons. Picnics are not allowed into the zoo. We advise you to get the "Pass Caraïbes", so you may start the day visiting the Habitation Côte Sous le vent where you can picnic inside, and then spend the afternoon in the zoo. The zoo is not a walk for our lovely dogs or pets. They might fear or excite the animals in their enclosures. We advise you to avoid visiting the zoo with any pets. Our gift shop is selling many goods relative to the guadeloupe zoo and the animal species conservation : soft toys, books, DVD, stationery articles, textiles, luggage, games, jewels, coin collection... all souvenirs and gift ideas !